EPIC is a 3D CG action-adventure comedy that reveals a hidden world unlike any other. 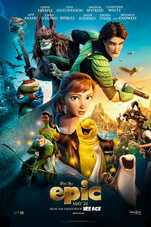 From the creators of ICE AGE and RIO, EPIC tells the story of an ongoing battle deep in the forest between the forces of good who keep the natural world alive and the forces of evil who wish to destroy it. When a teen age girl finds herself magically transported into this secret universe, she must band together with a rag-tag team of fun and whimsical characters in order to save their world... and ours.